In the past, some companies used to give expatriate assignments to employees seeking additional income or the adventure of working in an exotic locale. In today’s global marketplace, however, companies now need to be more strategic about these assignments. Not only must they address a business need, they must also be given to top-performing people who will add value for the company and grow professionally at the same time. 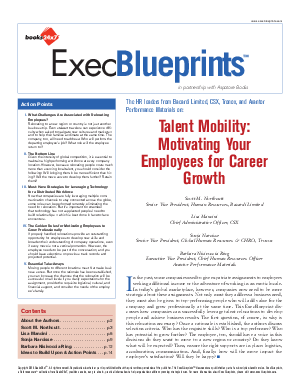 This ExecBlueprint discusses how companies can successfully leverage talent relocations to develop people and achieve business results. The first question, of course, is: why is this relocation necessary? Once a rationale is established, the authors discuss selection criteria. Who has the requisite skills? Who is a top performer? Who has potential to grow further? The employee, too, should have a voice in this decision: do they want to move to a new region or country? Do they know what will be expected? Then, ensure the right supports are in place: logistics, acculturation, communication. And, finally: how will the move impact the employee’s satisfaction? Will they be happy?